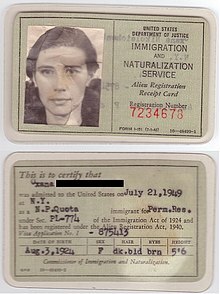 ^ 1.0 1.1 Green Card. USCIS. [2016-04-09]. ^ New Design: The Green Card Goes Green. USCIS. [2016-04-09]. 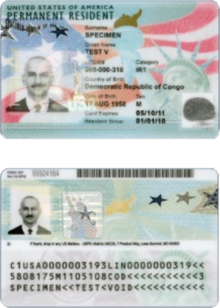 ^ USCIS Announces Redesigned Green Card: Fact Sheet and FAQ. American Immigration Lawyers Association Website. [2016-04-09]. ^ 8 U.S.C. § 101 et seq. USCIS. [2016-04-09]. ^ Family-Based Immigrant Visas. United States Department of State. [2017-05-25]. ^ Employment-Based Immigrant Visa. United States Department of State. [2017-05-25]. ^ 7.0 7.1 7.2 7.3 7.4 7.5 7.6 7.7 7.8 Visa Bulletin. United States Department of State. [2016-04-09]. ^ 8.0 8.1 Asylum. USCIS. [2016-04-09]. ^ Do I need to carry my green card with me?. CitizenPath. [2016-04-09]. ^ 10.0 10.1 How do I get a reentry permit? (PDF). USCIS. [2016-04-09]. ^ USCIS Processing Time Information. USCIS. [2016-04-09]. ^ 12.0 12.1 Citizenship Through Naturalization. USCIS. [2016-04-09]. ^ Countries that Offer a Visa Waiver for US Green Card Holders. Path2US. [2016-04-09]. ^ I-130, Petition for Alien Relative. USCIS. [2016-04-09]. ^ I-140, Immigrant Petition for Alien Worker. USCIS. [2016-04-09]. ^ I-751, Petition to Remove Conditions on Residence. USCIS. [2016-04-09]. ^ I-131, Application for Travel Document. USCIS. [2016-04-09]. ^ USCIS to Issue Employment Authorization and Advance Parole Card for Adjustment of Status Applicants: Questions and Answers. USCIS. [2016-04-09]. ^ I-765, Application for Employment Authorization. USCIS. [2016-04-09]. ^ USCIS to Issue Employment Authorization and Advance Parole Card for Adjustment of Status Applicants: Questions and Answers. USCIS. [2017-01-07]. ^ Consular Processing. USCIS. [2016-04-09]. ^ I-407, Record of Abandonment of Lawful Permanent Resident Status. USCIS. [2016-04-09]. ^ Maintaining US Lawful Permanent Resident Status. usvisalawyers.co.uk. [2016-04-09]. ^ Renew a Green Card. USCIS. [2016-04-09]. ^ Estimates of the Legal Permanent Resident Population in 2010 (PDF). United States Department of Homeland Security. [2016-04-09].